If it’s safe for you to get on the roof, learn how to inspect and maintain your chimney and do your own chimney repair work. Contractors can be expensive; human nature may lead them to suggest work that’s not really needed. There are safety issues, however, that should be addressed only by qualified, insured chimney sweeps. Among these are cleaning and inspecting chimney flues. Using high-tech equipment, a chimney sweep can detect breaches in your flue lining that can lead to chimney fires. With that said, we’d like to outline some tasks you can easily do for yourself. The chimney crown is the concrete area surrounding the flue or flues on a chimney. Think of it as the ‘roof’ of your chimney. Inspect your crown once a year. Look for cracks or missing chunks of concrete. If the crown is completely intact, forget about if for a year. Small cracks, however, get to be bigger ones through the process of freezing and thawing. Eventually you’ll need a multi-thousand dollar crown replacement UNLESS you do easy preventive maintenance yourself. If pieces of your crown are missing , trowel on a coat of CrownSeal, the professional grade product that offers a 10 year warranty. If there are just cracks no more than 1/4″ wide , use CrownCoat, a brush-able latex product that is guaranteed for 15 years. Either of these products will make your chimney crown waterproof. Flashing is a narrow band of metal that seals your roofing material to your chimney, or to skylights or dormers. It’s often the location of leaks. 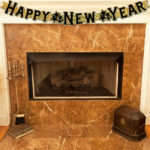 Inspect it once a year when you check out your chimney crown. If your chimney is leaking into your home, but not into your fireplace, it’s a good bet that the flashing around the chimney needs repair. FlashSeal is the professional’s choice for this task. You can choose black, white, or brown FlashSeal. Clean up the areas you suspect and apply a coat of FlashSeal about 4 inches up the sides of the chimney and about 4 inches across the roof. Then lay a piece of 6″ wide FlashSeal reinforcement fabric in the wet Flash Seal and apply another coat over the fabric. That’s it. You’re covered by a 7 year warranty. While you’re on the roof, check your chimney for deteriorating mortar joints, staining, or moist-looking areas. If you see small (1/8″-3/16″) cracks between bricks and the mortar holding them in place, apply CrackMagik, using the brushes that come with the product. Now you’re set for 10 years. Remove soot stains, rust, mildew, moss, and creosote with Brick & Mortar Cleaner. You can apply it with a paint roller. 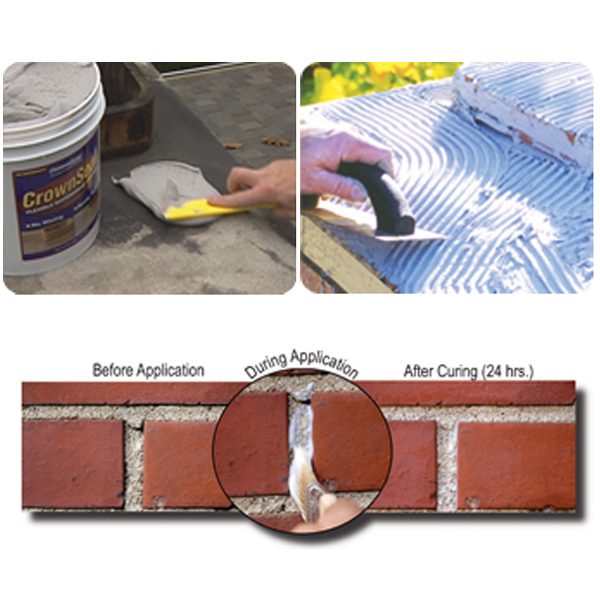 If bricks look like they are retaining moisture , seal them with ChimneySaver Water Repellent. There’s a water-based version and two solvent-based versions, one of which complies with VOC (Volatile Organic Compounds) laws of all 50 states. You can apply any version with an inexpensive low pressure sprayer. With top quality, professional grade chimney repair products and a minimum of tools, you can save yourself thousands of dollars over the lifetime of your home by doing your own chimney repair and maintenance. But please plan your work with safety in mind.